North Bay theater kicks off the new year with 6th Street Playhouse’s Honky Tonk Angels, a country-music revue by Ted Swindley. Swindley, best known for the community theater staple Always . . . Patsy Cline, has taken about 30 country standards and wrapped the thinnest of stories around them to create a raucous and enjoyable evening of entertainment. The plays tells the tale of three would-be singers, each stuck in a rut, who decide to take a chance and follow their dreams of a singing career to Nashville. There’s Angela (Daniela Innocenti-Beem), queen of her double-wide, who’s having trouble standing by her man (cue Tammy Wynette); Darlene (Abbey Lee), who’s struggling with being a coal miner’s daughter (cue Loretta Lynn) and the loss of her boyfriend Billy Joe (cue Bobbie Gentry); and Sue Ellen (Amy Webber), who’s fed up with the chauvinist boss at her 9-to-5 job (cue Dolly Parton). Director Michael Ross has a trio of talented women for angels. Innocenti-Beem as Angela is the unabashed leader of the trio. As the oldest and most worldly member, she grabs hold of the stage—and the audience—and never lets go. Webber gives her a run for her money as the brassy, big-haired Sue Ellen, while Lee has the quieter moments as the wide-eyed, innocent Darlene. Swindley’s script—if you can call it that—doesn’t provide character depth and there’s no great message to be found beyond the pat “follow your dreams” axiom, but what Honky Tonk Angels does provide is the opportunity to hear some great American music performed live. Music director Robert Hazelrigg and musicians Ian Scherer, Quinten Cohen and Kassi Hampton handle the country/bluegrass songbook well. Credit the women for bringing the right amount of character and a quality voice to each song, particularly on some sweet three-part harmonies. When it comes to shows like Honky Tonk Angels, it is all about the songs. They’ve got this. 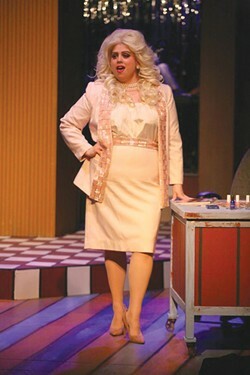 ‘Honky Tonk Angels’ runs Thursday–Sunday through Feb. 4 at 6th Street Playhouse. Thursday–Saturday, 7:30pm; Saturday–Sunday, 2pm. $22–$38. 52 W. Sixth St. 707.523.4185.